(CNN) -- The flu is spreading fiercely across the United States, with more than 40 states reporting widespread activity in what one of the nation's leading health officials is calling an epidemic. "If you look at the charts that the (Centers for Disease Control and Prevention) put out on their website, it clearly has gone above that threshold. So we are into what would classically be described as a flu epidemic," Dr. Anthony Fauci, director of the National Institute of Allergy and Infectious Diseases at the National Institutes of Health, told CNN's Wolf Blitzer on Thursday. "It's still on the uptick," Fauci added. The season has started earlier, and cases are more severe than last year, health officials say. The latest Centers for Disease Control and Prevention flu advisory report, which covers the week of December 23 to 29, suggests that 41 states have widespread influenza activity, which was an increase of 31 states from the previous week. The CDC will issue an update on the flu situation Friday. There have so far been 2,257 hospitalizations associated with laboratory-confirmed flu virus, the CDC report said. Among children, there have been 18 deaths reported during this season. Various state agencies also are compiling statistics on flu-related deaths. This is only about week five in a 12-week flu season, according to Fauci. "Remember, once it peaks, you still have a considerable amount of time where there is a lot of flu activity, and right now it may have peaked in some places, but for the most part, it has not yet peaked," he said. In Massachusetts, one of the 29 states that the CDC has identified as having high activity of influenza-like illness, Boston Mayor Thomas Menino declared a public health emergency in the city Wednesday because of the flu. Since October 1, there have been 700 confirmed influenza cases among Boston residents, according to Menino's office; that's 10 times more than were seen in all of last year's flu season. There have been 18 flu-related deaths this season in Massachusetts, CNN affiliate WCVB reported. Hospitalization rates are higher than the last two years, Kevin Cranston of the state's Bureau of Infectious Diseases told WCVB. Most deaths have been in older patients, he said. Menino is collaborating with the Boston Public Health Commission and community health centers to offer free vaccination clinics this weekend. The mayor urged residents to stay home from work or school if they are sick, and to get their flu shots. "This is the worst flu season we've seen since 2009, and people should take the threat of flu seriously," Menino said in a statement. More than 4% of emergency department visits at Boston hospitals are from flu cases, up from 1% during non-flu season. Massachusetts General Hospital has already counted 532 cases of flu among patients, which is more than the Boston hospital saw in any of the previous three flu seasons, spokeswoman Kristen Stanton said Wednesday. Signs posted throughout the hospital discourage anyone from visiting who has a cough or fever, she said, and anyone who does visit with those symptoms must wear a mask and perform hand hygiene. All staff must wear a mask when providing care for possible flu cases. Any staff member who has not been vaccinated must wear a mask while caring for any patient. In Onondaga County, New York, health officials counted 2,347 flu-season cases through last Saturday. In 2011, during the same seasonal time period, they counted five flu cases. Somerville, Massachusetts, a small city north of Boston, announced that the city's supply of flu vaccine for the season had run out. All 720 doses for the season that were being administered for free had been given out by Tuesday. Residents looking to get vaccinated should contact their primary care physician or local pharmacy, the website said. That the city's vaccines have all been given out is somewhat surprising because normally there are about 100 doses left over at the end of a season, spokeswoman Jackie Rossetti said Thursday. She attributes this to an earlier start of the flu season and outreach efforts. Somerville has asked the state's public health department if there are any more available vaccines for the city and is waiting to hear back, she said. Most local pharmacies have doses left, however, she said. The Oklahoma Department of Health said Thursday the state has had eight influenza-linked deaths since September 30. Additionally, the Minnesota Department of Health has counted 27 flu-related deaths. "We are clearly at a high level of influenza activity in the state," Minnesota Health Commissioner Dr. Edward Ehlinger said in a statement. "But it's important to keep this year in perspective: What is occurring has happened before." Pennsylvania has had 22 flu-related deaths so far this season, according to data from the state's Department of Health. Most of these deaths occurred among people older than 65, but the fatalities included two individuals younger than 50 who were otherwise healthy. Lehigh Valley Hospital-Cedar Crest in Allentown, Pennsylvania, set up a heated tent outside the hospital to serve as a clinic. Anyone with mild flu symptoms can be treated quickly and discharged, isolated from more serious cases. The hospital has been seeing an additional 80 to 100 patients with flu-like symptoms daily, officials told CNN affiliate WPVI. Indiana has seen 13 confirmed adult flu-related deaths since November 1, and two pediatric deaths, according to the state's health department. Arkansas has seven confirmed flu fatalities. Many of the hospitals are at capacity because of the flu or other illnesses, state health spokesman Ed Barham said. South Carolina has counted 22 flu-related deaths this season, compared with one for all of 2011, according to the South Carolina Department of Health. From September 30 through January 5, the state saw 1,084 influenza-related hospitalizations, the department said. In Illinois, Department of Public Health Director Dr. LaMar Hasbrouck said Wednesday that since October, six flu-related deaths of patients in intensive-care units have occurred. "We have been and continue to see an increase in flu activity across the state. The flu strain that is predominately circulating this year is typically more severe, with more hospitalizations and deaths," Hasbrouck said. "From the beginning of October through the end of December we've seen almost 150 people admitted to hospital intensive care units with influenza like illness. "This compares to last year at this time when there were only two ICU hospitalizations and no deaths." In Michigan, there have been four pediatric deaths related to the flu, said Angela Minicuci, public information officer for the Michigan Department of Community Health. And the North Dakota Department of Health is reporting 1,077 cases of flu in the state as of Wednesday -- a sharp increase from the 625 cases reported last week. Dr. David Zich, internal medicine and emergency medicine physician at Northwestern Memorial Hospital in Chicago, said this is the worst flu season he's seen in his 12 years at his hospital, in terms of the concentration of patients. Northwestern Memorial Hospital is on "bypass," which happens when it is beyond capacity because of an influx of patients, such as during flu season. That means advanced-life support ambulances with patients who are stable are referred to the next closest hospital, no more than five minutes away, Zich said, and transfers are not accepted from outside hospitals. For everyone else, they are open for business. "The majority of flu patients are sent home, with very little else done, so we can handle that," he said. Zich theorizes that one reason there are so many flu cases is that the heart of the flu season coincided with the December holiday season, meaning many people were already sleep-deprived from parties and were more likely to get sick. Those who went to gatherings of family or friends may have already begun to feel sick, and spread the virus to others. People are generally contagious the day before symptoms start, and for five days after becoming sick, according to the Centers for Disease Control and Prevention. Last flu season was light, but this year has brought with it some "ominous signs," Fauci of the NIH said Tuesday. Flu cases started going up early, toward the end of November and the beginning of December, he said. "And it went up on a pretty steep trajectory," he said. "The last time we saw that happen that way was the flu season of 2003 and 2004, which turned out to be a bad flu season." The type of flu that is going around is called H3N2, which is often linked to more serious disease compared to other flu varieties, Fauci said. But there's good news: That type of flu matches up well to the vaccine that is being distributed and given out throughout the United States. People may get more complications from this particular strain of H3N2, "which may make them ill for a longer period of time," Dr. Michael Jhung, medical epidemiologist in the influenza division at CDC, told CNN's Mary Snow. "But symptoms typically last up to seven days for a normal infection, a noncomplicated infection with influenza," he said. "And we usually see that from year to year regardless of what strains are circulating." In a "light" year, a few thousand people may still die, but a particularly serious year could see up to 49,000 deaths from the flu, Fauci said. "There's an average of about 200,000 hospitalizations and there's a lot of economic burdens." If you haven't gotten an annual flu vaccine, it's not too late, doctors say. To further protect yourself, try to avoid anyone who is sneezing and coughing, and wash your hands. Also, exercise and eat healthy foods, Zich said. Most flu patients should not go to an emergency room, Zich said. They will likely be sent home, as there is very little that can be done for them. A fever as high as 103 degrees Fahrenheit is common in the flu. Patients with normal flu symptoms should get a lot of rest and take painkillers to help with muscle aches, Zich said. "In five to seven days, you're going to be feeling yourself again," he said. But there are scenarios in which going to a hospital is necessary. If a patient is short of breath, or can't keep fluids down because of nausea, these are signs of a problem that needs immediate attention, as vomiting or sweating from fever can lead to dehydration, Zich said. An otherwise healthy person will not get much benefit from antiviral medications designed to treat symptoms that the flu causes, Zich said. The side effects from both oseltamivir (Tamiflu) and zanamivir (Relenza) include nausea. The CDC recommends that people who have a higher risk of complications from the flu receive antiviral treatment. These include people with chronic illnesses such as pulmonary, cardiovascular and neurological conditions, as well as anyone 65 years and older and children under age 2. 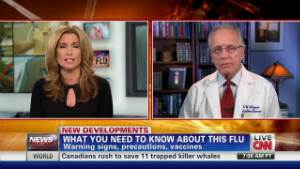 What many people don't know is that the flu vaccine becomes less effective as you get older or develop other medical problems, Zich said. The flu shot relies on the body's antibodies against the flu, so if the immune system is already compromised, it will not work as well. If you have the flu, how are you treating it? Send photos of your flu survival kits. CNN's Maggie Schneider contributed to this report.